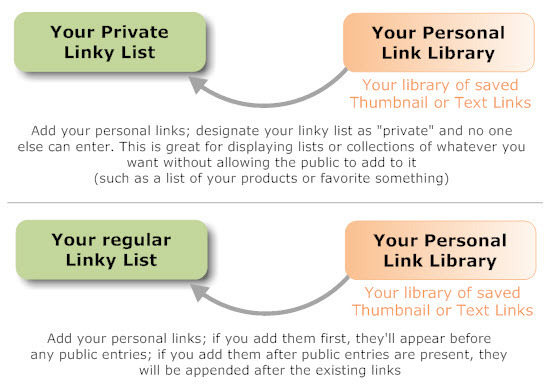 In summary, the Personal Link Library is a collection of your saved links (both text and thumbnail) that you can add to your linky lists over and over. You manage your Personal Link Library separately. No matter how many times you add the same personal link to a linky list, it remains in your library for future use. 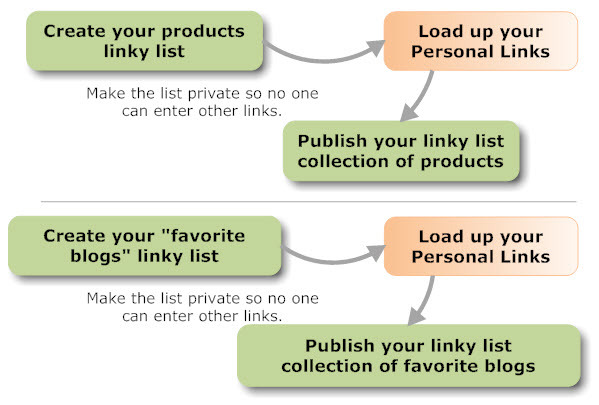 Once a personal link is added to a linky list, it is not connected to the original in your library. So if you delete it, or revise it in the linky list, the library original is unaffected. Likewise, if you revise or delete the original link in your personal library, the copies you added to linky lists are unaffected. You can use your Personal Link Library to create private linky lists (closed to public entries) or to add your personal links to a public linky list. For private use, simply designate your linky list as "PRIVATE" in the linky list options. Then use the "Add Personal Links" from your dashboard for that list. For public use, click "Add Personal Links" from your dashboard. You can load up your own personal links before publishing the list publicly, or you can append personal links to list that already has public enties. You have standard links you want all your linky lists to start with... save them in your Personal Link Library for quick access. or lists of things you want to put on your blog. Here is a list of ideas and suggested uses. Don't let this limit your imagination. There really are no "rules" about how to use your Personal Linky Library. Keep the general concept in mind: you can create your own library of saved text and thumbnail links. Then you can add them to any linky list in your Dashboard. A linky list can be "private" so that it is just a collection of your owned saved links... or it can be public allowing others to add to your list.